The uniqueness of this fried noodle dish is from the smooth and thick sauce, cooked with silky whisked egg, topped with a variety of tasty seafoods and balanced with vegetables. We love to go for lunch in a cozy Malaysian restaurant in Market Square, Sunnybank. The name of the restaurant, “Little Singapore” might get some people confused though. Why does a Malay restaurant name itself with the word of “Singapore”? Little Singapore is often packed with customers, Asians, Aussies and other foreign visitors. 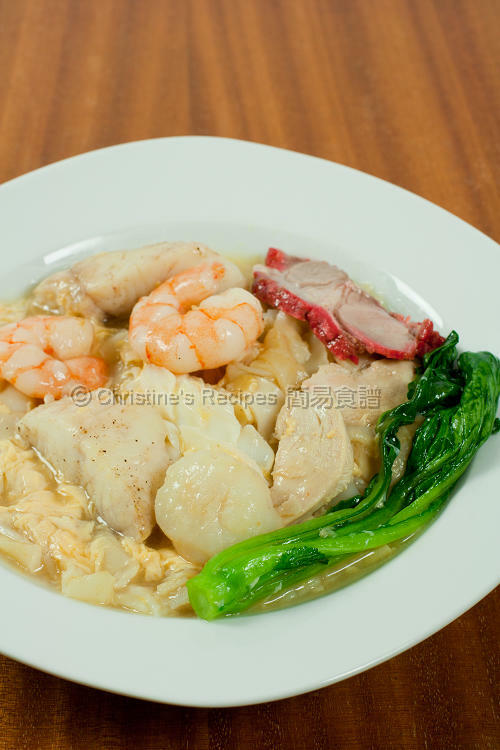 The most favourite dish that my hubby loves to order is their Combination Seafood Rice Noodles. It’s very different from those of Hong Kong style. Trying to surprise hubby. I whipped up this dish the other day for lunch. Many Asian restaurants would keep their recipes/dishes as their business secrets. If not impossible, it’s really hard to get any recipes from them. If only I could have the same charisma of Trissa from Trissalicious getting every recipe that she likes from restaurants, I would surprise my hubby everyday. The following recipe was my own creation done from scratch. I felt the taste and look of this dish were quite similar to Little Singapore’s. It's so amazing to see hubby having finished the whole big plate. Use chopsticks or hands to separate noodles. If you don’t want your flat rice noodles soggy and sticky, please refer to this previous recipe. Rinse prawns and drain well. Mix with salt and pepper for a while. Rinse in running cold water for 5 to 10 minutes in order to get the meat more springy. Pat dry with kitchen papers. Mix chicken with marinade for 15 minutes. Set aside. Heat a small amount of oil in pan over medium high heat. Add noodles, and heat evenly. Pour 1 tablespoon of soy sauce and stir to mix well. Transfer to a serving plate and cover to keep warm. Add oil to pan, cook chicken over medium heat. Cook until chicken turns white. Add fish and cook until done. Set aside. Use the same pan, add oil to pan fry prawns, squid and scallops separately until 80% done. Set aside. Pour in chicken stock to pan and bring to a boil. Let cook and reduce a bit. Add a bit of oil. Toss in choy sum. Add chicken, prawns, squid, scallops and fish. When it boils, add char siu. Season with salt. Add thickening and cook to your preferred consistency. Pour in whisked egg. Quickly stir. Remove from heat. Pour the mixture over noodles. Serve immediately. I used snapper because the meat won’t be broken into pieces after stirring. You might like to use any other white fish fillets to your liking. The sauce of this fried noodles should be quite thick. If the sauce is still runny, add more cornflour dissolved in water. When it comes to cook this dish, it’s very flexible. You can choose any seafoods you like or come in handy. It looks so yummy and just like from a zhi char restaurant! yummy!! I am a big fan of this kind of noodles! Wooo...好丰富! Yesterday I "ate" the Hor Fun at Anncoo Journal, today I am "eating" yours. I don't mind it at all! I love Little Singapore and they've opened one in the city which makes it so convenient for a yummy lunch! No wonder your hubby walloped the whole plate of hor fun! It looks so yummy with so much goodies in it! You can open shop already! 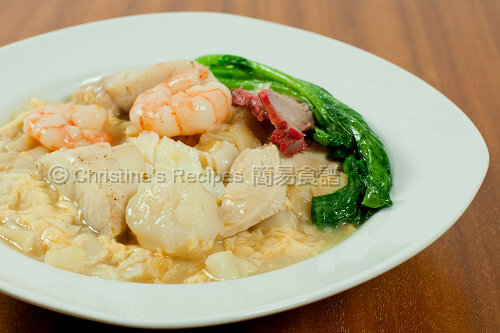 Christine, Thanks for the mention :) I really love "河粉" and don't mind to have this everyday. It's me again.....thanks so much for mentioning my 'Wat Tan Hor Fun'. Only saw it after posting my earlier comment! My hubs love wat dan hor! Looks so delicious! Lol! You are so funny! I have a hard time getting recipes from Chinese/Asian restaurants! But why would you need the recipe anyway when you are such a good cook anyway. If I could cook as well as you I wouldn't need to ask recipes from restaurants! Love this dish. One of my staples at Chinese restaurants. yum yum yum, this is my all time favourite kind of food. unfortunately my partner hates seafood, so i can't whip up this little feast for him. I will finish the whole plate too! I love these kinds of seafood noodles - thanks for sharing the recipe! I think I can finish the whole plate too! Hello Christine, please could you add a Pinterest link to the photos. I cannot save to Pinterest with a photo. If you hover your mouse over the top right corner of any images, it'll instantly display a Pinterest button. Just a click to pin it on your board.